I’m on a Mollie Katzen kick again. As you may recall, we love her Pretend Soup book and my husband regularly makes her popovers for a weekend breakfast. While visiting family on Saturday, I came across her classic, The Enchanted Broccoli Forest book! I’ve been aware of this book forever, but I had never read it before. I have to say I’m smitten. I love her writing, her illustrations, and her amazing recipes. But mostly I love that when she writes them, there is always room for improvisation which she wholeheartedly encourages. She fully communicates the joy of making tasty, healthy food, being creative with it, and eating it! There are a ton of things I want to make from the book. There are fabulous dressings, dips, bread, vegetable, salad, and soup recipes I know I will be making in the future. The other night, I made the Onion Sour Cream Pie, but changed it up a bit. I made the walnut crust as a base. For the filling, I omitted the sour cream (because I can’t eat it) and substituted ricotta cheese in its place. I also omitted the lemon juice and added thyme as a seasoning. 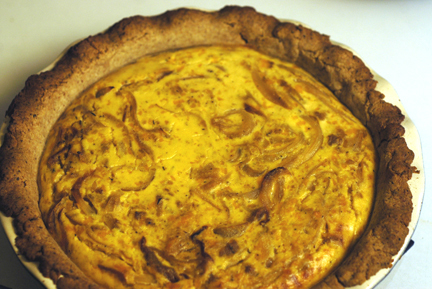 The result was a flavorful savory pie with a nutty, wonderfully crumbly crust. 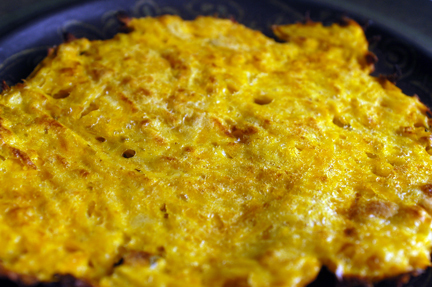 It was very much like an onion quiche but more rustic. This pie would also be good with some sauteed mushrooms in the filling! 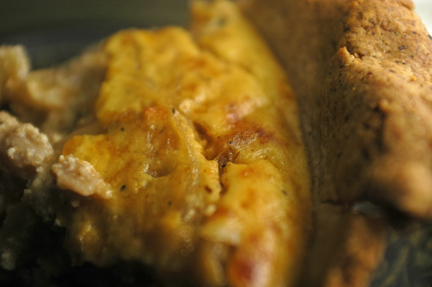 We ate our slices with crisp green salads which perfectly complimented the buttery, nutty, cheesy richness of the pie. 1. 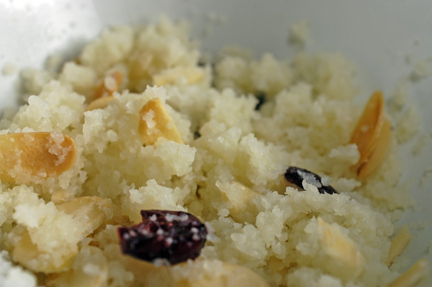 Process the nuts, salt, butter and flour in a food processor, pulsing several times to mix up. 2. While processor is running, drizzle in ice water. When dough starts to come together, stop machine. 3. Dump dough out onto floured board and roll out into a circle to fit a pie dish. Transfer to pie dish and crimp edges. Chill until ready to fill. 2. Saute onions in butter in skillet on stove over medium heat. Season with salt and thyme until soft. Add flour to thicken. Cook until onions are soft. Add water a little bit at a time to prevent too much sticking to the pan. Set aside to cool a bit. 3. Mix yogurt, ricotta, cheddar, one egg, and one egg yolk (reserving egg white in a separate bowl) together in food processor until smooth. (I used the same unwashed bowl that I processed the crust ingredients in!) Transfer to a big bowl. 4. Stir sauteed onions into dairy mixture. 5. Brush crust with some of the saved egg white. Pour onion mixture into crust. In my last post, I mentioned a wonderful way to cook chicken and make delicious broth at the same time. This is one of the meals I made with the fruits of those labors: Chicken Enchiladas. So easy and yummy. 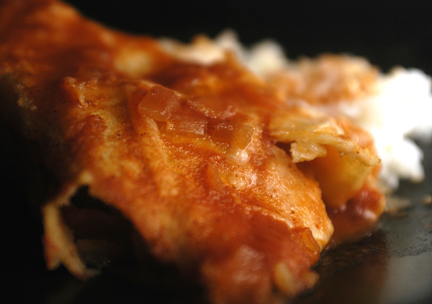 I did a post a couple of years back on Chicken Enchiladas that I made with my mom (I grew up with this dish), and I think I’ve improved it (sorry, mom!)! 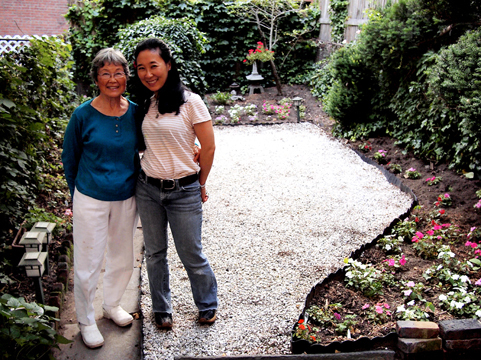 My friend, Judy, of Bebe Loves Okazu (check out her beautiful, beautiful blog!) had mentioned she had made it but sauteed the onions. Also, she wanted a thicker sauce. I was keeping this in mind when I redid this recipe. I also streamlined it a bit and instead of spraying and softening the tortillas in the oven, I just covered 6 at a time with a damp paper towel and heated in the microwave. Sauteing the onions gave the dish a sweeter, milder flavor, and made the sauce tastier. I reduced the amount of broth and increased the tomato sauce, which made the resulting sauce thicker — perfect for serving at the table. 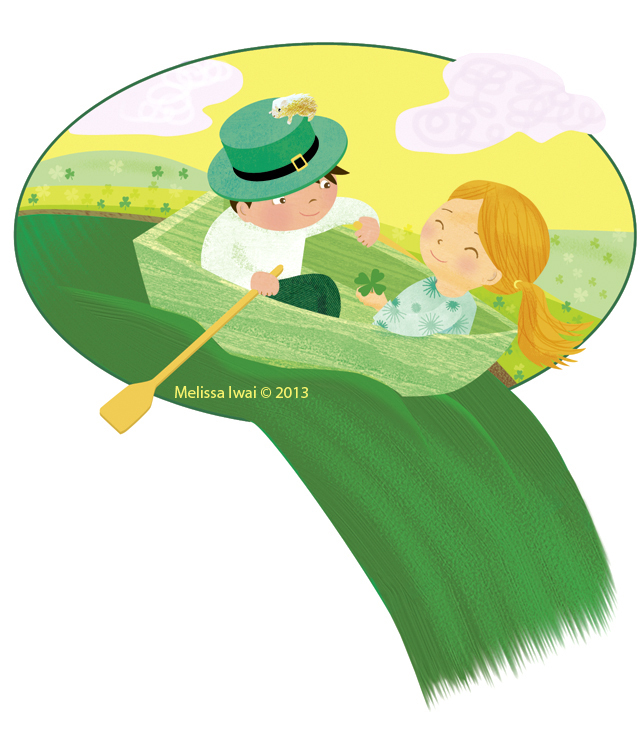 Hope all of you have a wonderful Saint Patrick’s Day this Sunday! I plan to relax with my family and just enjoy being. 🙂 Here is an image I did for the occasion with the same kids from Valentine’s Day. May good luck flow your way! 2. Saute diced onion in oil on stove in a large pot. 3. When onions are softened and translucent, transfer about 80% of them to a bowl and set aside. To the remaining cooked onions in pot add tomato sauce, chicken broth, chili powder, and salt to taste. Bring to a simmer and cook for about 20 minutes, until thickened. 4. Heat 6 tortillas at a time, covering with a damp paper towel, in the microwave for 45- 50 seconds, until warm and pliable. 5. Pour some sauce into a 9-inch by 13-inch baking pan to coat bottom. 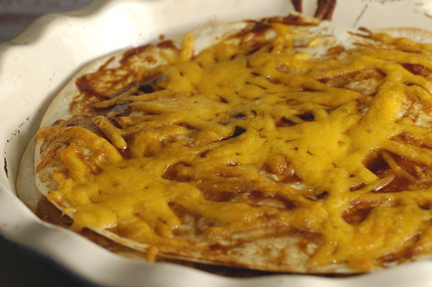 Lay one of the warmed tortillas in dish and coat both sides with sauce. 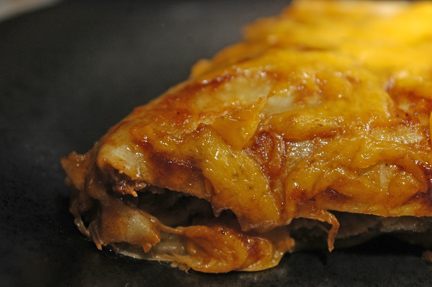 Then fill with a handful of chicken, sprinkle of sauteed onions, and a bit of shredded cheese. Roll up into a tube seam-side down. Continue with five more warmed tortillas. Then warm the remaining 6 tortillas and fill these in the dish, adding sauce to coat, as needed. 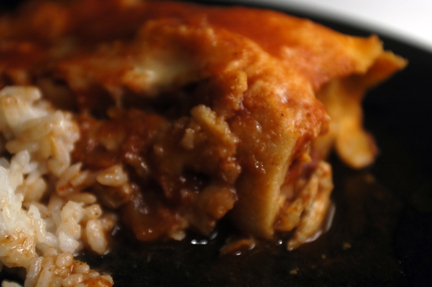 For the last two enchiladas, you may want to coat, fill and roll in another dish because there isn’t much space left. I find that doing the bulk of the filling and rolling in the backing dish itself helpful though, because you don’t have to worry about the tortilla breaking and spilling mid-transfer! 6. When all twelve enchiladas are arranged in baking dish, cover with cooked sauce, and sprinkle with remaining shredded cheese. 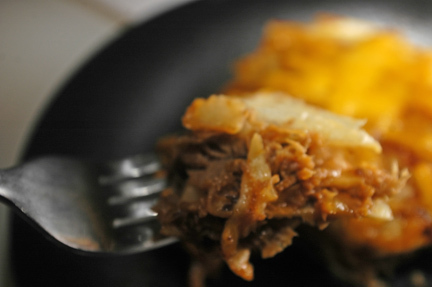 Cover with aluminum foil and bake for about 20-25 minutes. Alternatively, you could also refrigerate up to this time and bake later. We did this, and baked it for about 30 minutes. Makes 12 enchiladas. Serve with extra sauce. 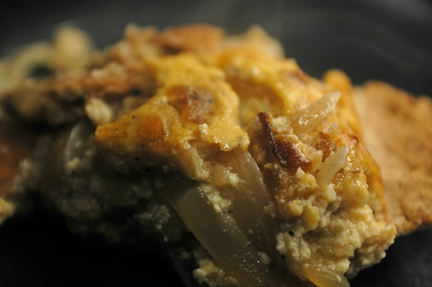 Another zucchini recipe here. It’s one of the few vegetables that my husband eats, so I try to figure out a lot of different ways to cook it! This one is an old favorite, and zucchini is so abundant and inexpensive now, I thought I’d share it with you all. It’s based on a recipe I saw many, many years ago in Cooks Illustrated, which has evolved over the years. First, prepare the zucchini. Cut in half lengthwise and spoon out flesh. A melon baller works the best, but if you don’t have one, use a spoon. I also cut a small slice on the bottom of each zucchini half so it has a flat surface to rest on, preventing it from wobbling so much. And don’t throw out the flesh! It is great in soup another day. See note below. For a readable, printable version, click here. Roast the zucchini halves with some potatoes tossed in olive oil and salt. While it’s roasting, saute onion, garlic, tomatoes until soft. Then add the roasted potatoes and some cheese and basil. 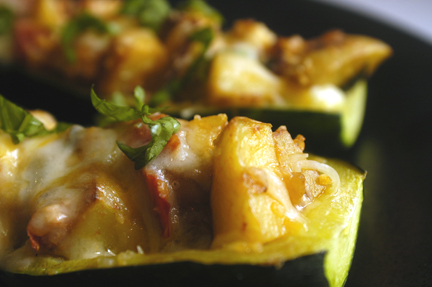 Fill zucchini halves with stuffing, top with more cheese and roast or broil until cheese as melted. Garnish with some fresh basil if you like. You know it has to be delicious if my vegetable averse husband eats it! Place two foil lined baking sheets in oven, one on top rack and one on bottom rack. Heat oven to 400 degrees. 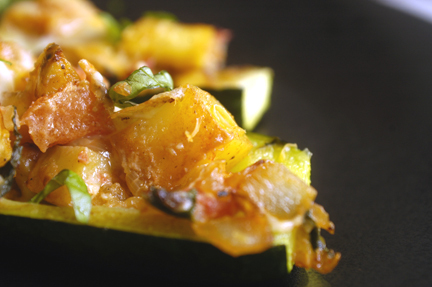 Cut zucchini in half lengthwise and scoop out interior flesh with a melon baller or spoon creating a zucchini “boat”. Reserve flesh for another time. 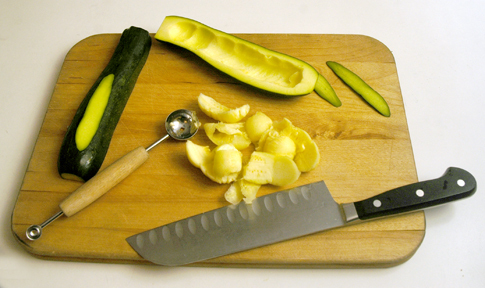 Cut off a sliver from bottom of each zucchini “boat” so that it can rest without wobbling. Brush cut halves with 1 teaspoon of olive oil. Sprinkle with salt. Roast in oven for 10 minutes on top baking sheet, cut side down. Toss potato cubes with 2 teaspoons of olive oil and season with salt and pepper. Gently remove heated empty baking sheet from oven. Spray with non-stick spray and transfer potatoes onto sheet, spreading into one even layer. Return to bottom rack in oven. Roast for 12 minutes, stirring halfway through cooking period. While zucchini and potatoes are roasting, heat remaining olive oil in large non-stick skillet. Sauté onions, stirring constantly, until onions are soft. Add garlic and sauté until fragrant, about 30 seconds. Season with salt and pepper. Add tomatoes and the roasted potatoes. Cook until tomatoes are soft. Off heat, add ½ cup cheese and 1/3 cup of the basil. Stir to combine. Turn zucchini halves over and divide potato filling among them. 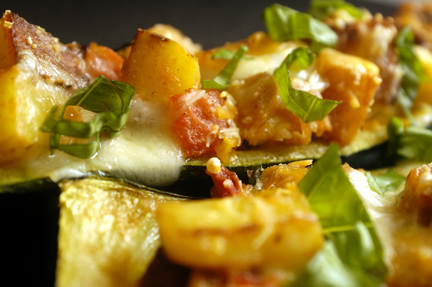 Sprinkle each with remaining cheese (about 2 tablespoon per zucchini half). Return to oven and roast for about 5 minutes on top rack, until cheese has melted. Garnish with remaining basil. Serve immediately (2 halves per serving). Note: I used to throw out the extra zucchini flesh I scooped out. 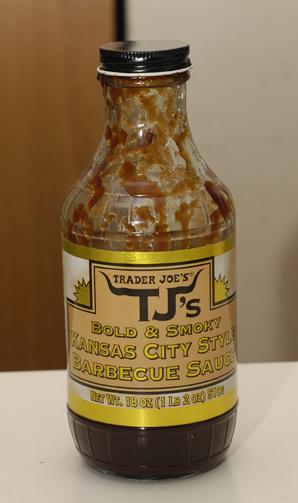 Now I save it in a container in the refrigerator and steam it later or throw it into a stir fry. There is a lot of it, so it’s really no point in throwing it away when you can use it in something else! 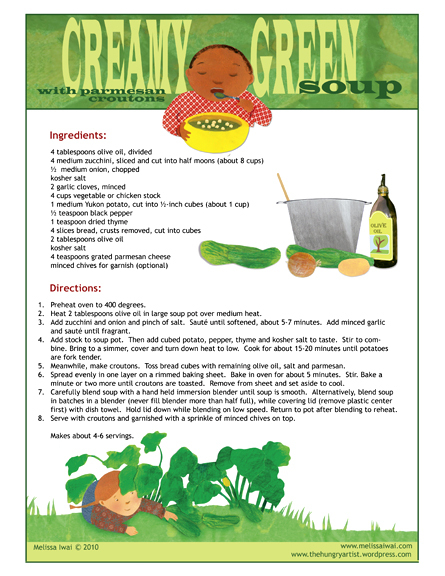 You can use it with more zucchini to make an easy creamy soup. Or halve the soup recipe amounts to make 2 servings with the leftover zucchini from this recipe. Denis did not photoshop this photo. His comment: What 82 year old woman has that jaw line!?? Other than when we took her to visit Denis’ lovely parents in Shelter Island, she’s been in our garden weeding, picking up leaves, pruning plants–basically working her green thumb magic on it (which I sadly did not inherit)! I wish I had “before” pictures to contrast this with! There were less flowers all around, and the rocks and back were covered in leaves and weeds! We call her the Energizer Bunny. Instead of eating out, she preferred me to cook “things from [my] blog” for her, so all week, I prepared various dishes for her and revisiting some old recipes. I bought a small bag each of Reese’s Pieces and plain M & Ms and scattered them on the batter before cooking in waffle iron. I discovered I don’t have to spend a lot of time searching for favorite recipes anymore — I can just do a search on my blog! For her last night here, I decided to make something special and created my version of a chicken salad with peanut sauce, because she had mentioned she had had a great one awhile back during her many travels. It is a quick and easy when you have leftover cooked chicken! We used more of the rotisserie chicken. 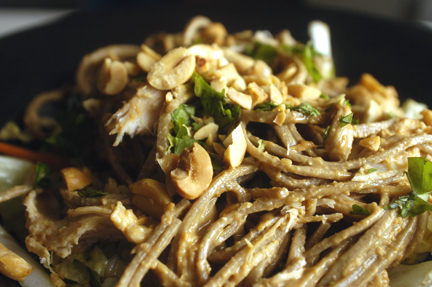 I also used my favorite peanut sauce recipe using roasted peanut flour (if you can’t find this, just peanut butter is fine–use this recipe instead minus sesame seeds) and coated cooked soba noodles and chicken with it (angel hair or vermicelli would work too). Then I made a salad with shredded Napa cabbage, romaine lettuce, shredded carrot, julienned daikon radish, cilantro, green onions, and snow peas. I topped the salad with the peanut sauce coated noodles and cooked chicken and garnished with more chopped cilantro and chopped roasted peanuts. We miss you obaachan! 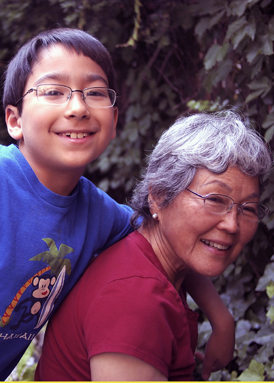 (Japanese for “grandma”) Thank you for all your hard work here!! Make peanut sauce. 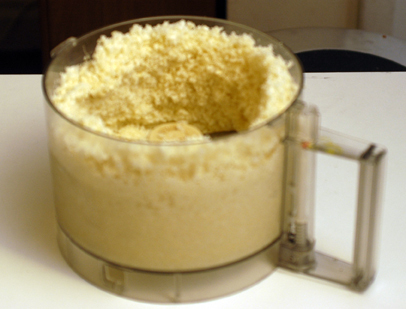 Process all ingredients (peanut butter to sesame oil) in a food processor until smooth. Transfer to a bowl and set aside. Prepare vegetables. Mix salad greens together in a large bowl, reserving about 2 tablespoons of the chopped cilantro for garnish. Set aside. Make vinaigrette. Whisk soy sauce, rice vinegar, and sesame oil together in a small bowl. Toss salad greens with vinaigrette to taste. Cook soba noodles according to package directions. Drain. Assemble salad. 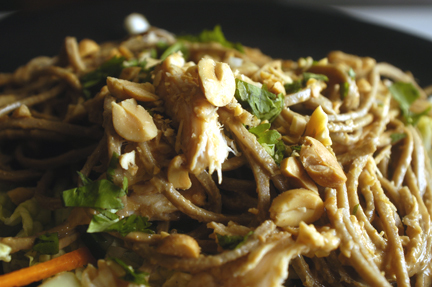 Toss cooked soba noodles with shredded chicken and prepared peanut sauce (use as much sauce as you want depending on how dry or wet you prefer the noodles—you will probably have some leftover!). Divide salad greens into four bowls. Top with noodles and chicken. Garnish with reserved cilantro and chopped peanuts. 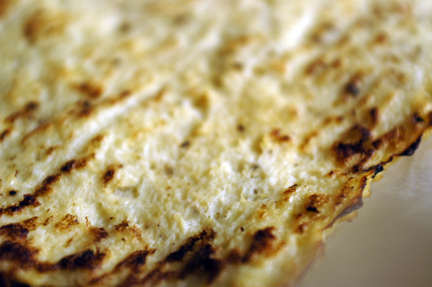 I love breads, cereals, rice, grains of any kind– I am not a carb hater. But I find my body is happiest when eating those things in moderation. When a friend of mine announced she was going “breadless” for awhile, I started thinking of all the yummy things she could eat in place of bread. 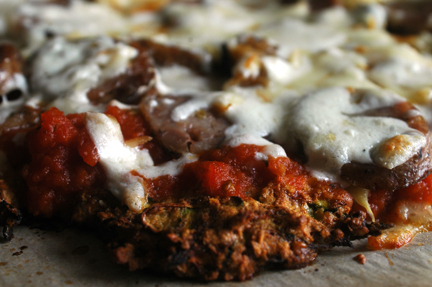 I’ve used shredded zucchini in the past as a base of a pizza crust during Passover. 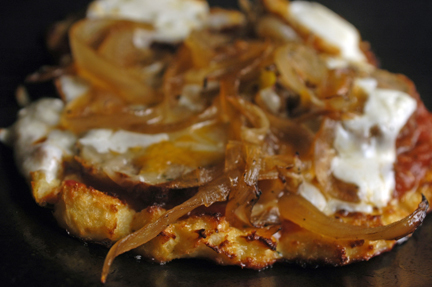 Another versatile vegetable is cauliflower. Pureed with a bit of cooking water, butter, cream, and salt, it makes a great substitute for mashed potatoes. Processed in a food processor until crumbly and then steamed for four minutes, it is also a great substitute for rice (though for me, I would not use it in place of Japanese rice). You can process it until it has the consistency of rice. I’ve also seen it various places used in a pizza crust. I’ve fiddled with the recipe and came up with one I use all the time as a single serving sans all the cheese. 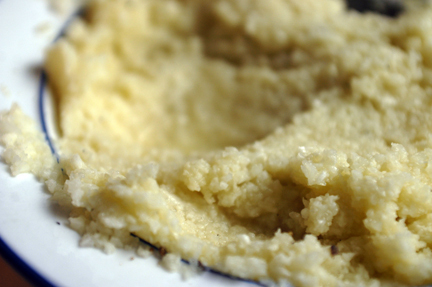 I mix my steamed cauliflower (I nuke it for four minutes without water, just covered with saran) with 2 tablespoons egg white (about one), 1 teaspoon grated parmesan, 1 tablespoon any kind of flour (wheat, soy, almond, chickpea, coconut, etc.) or matzo meal, and seasonings. It has a texture similar to polenta. Shape into a crust. I like to do it on parchment so it doesn’t stick. Bake at 400 degrees for 20 minutes. Place another piece of parchment on top, flip over onto baking sheet, then peel the top piece of parchment off the browned side. Bake another 5-10 minutes. 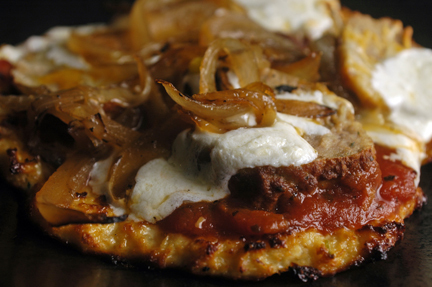 Cauliflower pizza with sausage and caramelized onions and mozzarella. 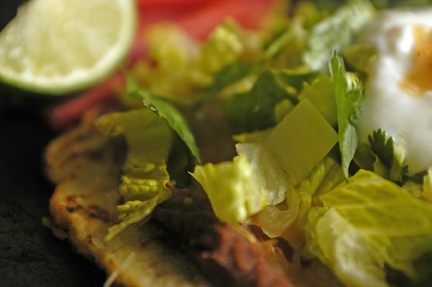 With refried beans, cheese, lettuce, salsa, and plain Greek yogurt. Recently, I tried shredded butternut squash (because I discovered I was out of zucchini) and it was fantastic! The texture was not as crunchy or crispy as the zucchini, but perhaps this could change if I used a bit less egg white and matzo meal instead of soy flour. I’m still experimenting. The flavor was great though! Now I’m also thinking of other combinations — shredded carrot and zucchini might be good… I’d love to hear if you try any of these, or come up with your own creations! 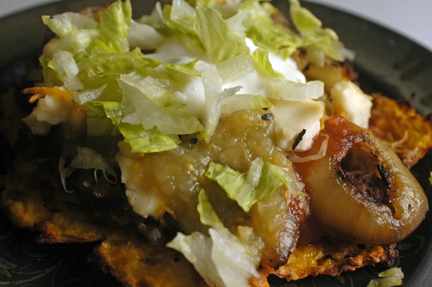 Butternut squash used as a tostada “shell” with refried beans, grilled veggies, lettuce, cheese, and Green yogurt. 1. Preheat oven to 400 degrees (I use a toaster oven). 2. Mix ingredients together in bowl. 3. 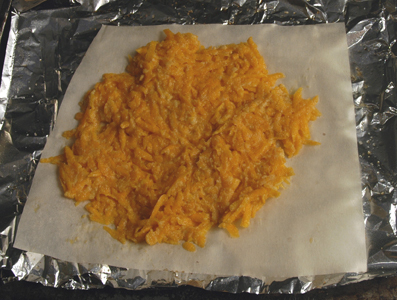 Shape crust into a 1/4 inch layer on parchment paper on baking sheet. 4. Bake for 20 minutes. 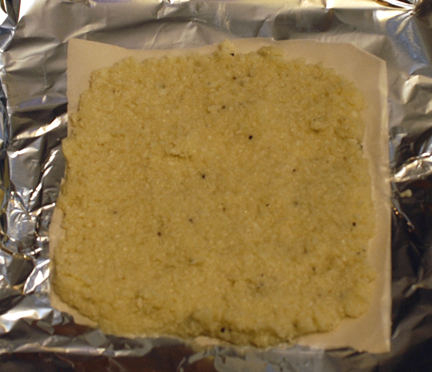 Place another piece of parchment on top, flip crust, and peel top sheet off of browned side. 5. Bake for another 5-10 minutes until desired browning is achieved. 6. 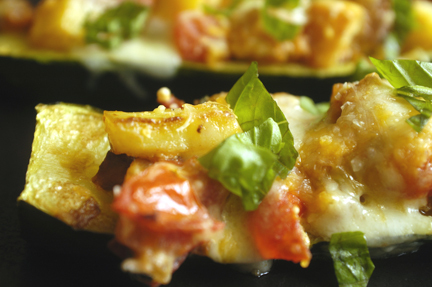 Use as a pizza crust or tostada shell and top with toppings of your choice.